Chronic hypertension of pregnancy: hypertension which is diagnosed prior to pregnancy, within the first 20 weeks of gestation, or which persists longer than 12 weeks after delivery. Gestational hypertension: hypertension which is diagnosed after 20 weeks gestation in the absence of proteinuria and other characteristics of preeclampsia (see below). Preeclampsia: hypertension diagnosed after 20 weeks gestation up to 4 weeks postpartum, accompanied by proteinuria and/or other features of end-organ damage. Chronic and gestational hypertension are typically managed on an outpatient basis by the OB/GYN providing prenatal care to the pregnant patient and do not often require management by the emergency clinician. Preeclampsia and eclampsia, however, are syndromes which can present acutely in the emergency department and can have devastating consequences to the mother and fetus if not recognized and treated appropriately. Preeclampsia is a syndrome which has been recognized for centuries but remains poorly understood. (5) The pathophysiology is thought to involve abnormal placentation in the first half of pregnancy, leading to poor placental perfusion and hypoxia-reperfusion injury. (1,2) This in turn results in oxidative stress, leading to the release of inflammatory markers, which then target the maternal endothelium. (1) This inflammatory state is thought to lead to the hypertension and other characteristics of preeclampsia. Most of the research on clinical diagnostics in preeclampsia and eclampsia examines the relationship of individual symptoms, exam findings, and clinical findings in predicting adverse maternal outcomes. 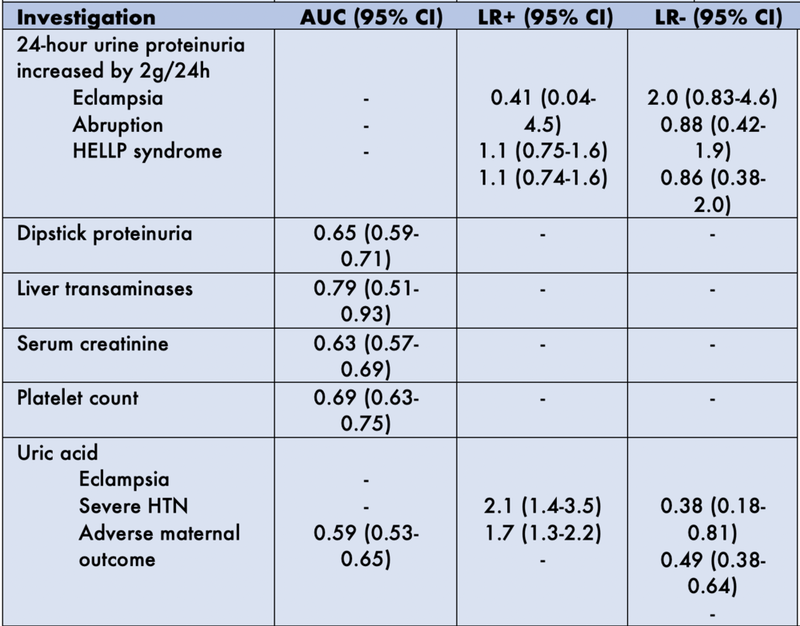 As seen in the chart below, adapted from Mol et al (11) which references several systematic reviews, ­the classical symptoms and diagnostic test findings seen in preeclampsia and eclampsia have not been shown to be individually stellar in predicting adverse maternal outcome. Within the past decade, attempts have been made to integrate diagnostic tests into multivariate models. Notable among these models is the PIERS (Preeclampsia Integrated Estimate of Risk) (12) model which was developed and internally validated in a multicenter prospective study which included 2023 women at tertiary care centers in Canada, New Zealand, and Australia. Patients were eligible for the study if they were admitted with preeclampsia or developed preeclampsia after admission. Multiple variables including demographic characteristics, past medical history, symptoms at onset, blood pressure, laboratory tests, and fetal assessment tests were examined and correlated with adverse maternal outcomes which were defined as maternal mortality; CNS, cardiorespiratory, hematologic, hepatic, or renal morbidity; or placental abruption. Using complex statistical analysis involving logistic regression, the study designers arrived at an equation that predicted adverse maternal outcomes within 48 hours, dependent on variables of gestational age, presence of chest pain or dyspnea, serum creatinine, AST, platelets, and SpO2. This model was internally validated through the bootstrapping method and allowed stratification of the study population into several risk categories. Of the women in the risk category with a probability of >0.30 calculated by the PIERS model equation, the majority (59%) had an adverse maternal outcome. The AUC for this equation was 0.88 (95% CI 0.84-0.92) establishing it as an equation with good accuracy (remember, a perfect test has an AUC of 1 and a worthless test has an AUC of 0.5). Several studies have successfully externally validated the PIERS model using other study populations. (13,14,15) However, further research is necessary to clarify the appropriate clinical applications of this equation, especially in the emergency department. Preeclampsia and eclampsia are “can’t-miss” diagnoses in the ED, since these conditions are progressive and can cause serious consequences for both the mother and the fetus. Emergency management of severe preeclampsia and eclampsia includes management of hypertension and administration of magnesium sulfate to prevent or abort seizures. While the evidence for individual tests in the diagnosis of preeclampsia may not be convincing, there is evidence that the treatment of preeclampsia and eclampsia, as currently classified by consensus guidelines, is beneficial. (8,9) Appropriate recognition and treatment of preeclampsia and eclampsia in the emergency department can contribute to prevention of their complications including pulmonary edema, myocardial infarction, stroke, ARDS, coagulopathy, severe renal failure, and retinal injury. (2) The definitive treatment is delivery of the placenta and the fetus, but in many cases the fetus is at risk for many of the complications of premature delivery. Ordering the tests discussed above, especially with the development of multivariate models, can help our OB colleagues risk-stratify these patients to determine whether or not they need to have an emergent delivery. Hypertension in pregnancy . Report of the American College of Obstetricians and Gynecologists’ Task Force on Hypertension in Pregnancy. Obstet Gynecol. 2013;122:1122–1131. Young, Janet Simmons. “Maternal Emergencies after 20 Weeks of Pregnancy and in the Postpartum Period.” Tintinalli’s Emergency Medicine: A Comprehensive Study Guide. Eds. Judith E. Tintinalli, et al. New York, NY: McGraw-Hill, 2015. Stone P, Cook D, Hutton J, Purdie G, Murray H, Harcourt L. Measurements of blood pressure, oedema, and proteinuria in a pregnant population of New Zealand. Aust N Z J Obstet Gynaecol 1995;35:32-7. Salhi BA, Nagrani S. “Acute Complications of Pregnancy.” Rosen's emergency medicine: concepts and clinical practice. 8th ed. Eds. Marx, J. A., & Rosen, P. Philadelphia, PA: Elsevier/Saunders, 2014. Bell MJ. A Historical Overview of Preeclampsia-Eclampsia. J Obstet Gynecol Neonatal Nurs 2010 September; 39(5): 510–518. Al-Safi, Zain. Delayed Postpartum Preeclampsia and Eclampsia Demographics, Clinical Course, and Complications. Obstetrics and gynecology (New York. 1953) (0029-7844), 118 (5), p. 1102. Hawkins T, Roberts J, Mangos G, Davis G, Roberts L, Brown M. Plasma uric acid remains a marker of poor outcome in hypertensive pregnancy: a retrospective cohort study. BJOG 2012 2012;119:484–492. Duley L, Henderson-Smart DJ, Walker GJ, Chou D. Magnesium sulphate versus diazepam for eclampsia. Cochrane Database of Systematic Reviews 2010, Issue 12. Duley L, Gilmezoghu AM, Henderson-Smart DJ, Chou D. Magnesium sulphate and other anticonvulsants for women with pre-eclampsia. Cochrane Database of Systematic Reviews 2010, Issue 11. Lim KH, Friedman SA, Ecker JL, Kao L, Kilpatrick SJ. The clinical utility of serum uric acid measurements in hypertensive diseases of pregnancy. Am J Obstet Gynecol. 1998;178:1067–71. Mol BWJ, Roberts CT, Thangaratinam S, Magee LA, de Groot CJM, Hofmeyer GJ. Pre-eclampsia. Lancet. 2016; 387: 999–1011. von Dadelszen P, Payne B, Li J, Ansermino JM, Pipkin FB, Cote AM, Douglas MJ, Gruslin A, Hutcheon JA, Joseph KS, Kyle PM, Lee T, Loughna P, Menzies JM, Merialdi M, Millman AL, Moore MP, Moutquin JM, Ouellet AB, Smith GN, Walker JJ, Walley KR, Walters BN, Widmer M, Lee SK, Russell JA, Magee LA, and the PIERS Study Group. Prediction of adverse maternal outcomes in pre-eclampsia: development and validation of the fullPIERS model. Lancet 2011; 377:219–27. Akkermans J, Payne B, von Dadelszen P, Groen H, de Vries J, Magee LA, Mol BW, Ganzevoort W. Predicting complications in pre-eclampsia: external validation of the fullPIERS model using the PETRA trial dataset. European Journal of Obstetrics & Gynecology and Reproductive Biology. 2014;170:58-62. Ukah UV, Payne B, Hutcheon JA, Ansermino JM, Ganzevoort W, Thangaratinam S, Magee LA, von Dadelszen P. Assessment of the fullPIERS Risk Prediction Model in Women with Early-Onset Preeclampsia. Hypertension. 2018 Apr; 71(4): 659–665.